If you ever had the fortune to visit Taiwan or Japan, it’s hard to deny the fact that Hello Kitty is pretty much on every street corner bench, subway cart, gondola ride, and just about everything else. You know how Dora the Explorer and Sesame Street have touched the lives of so many in America? Well… Hello Kitty is doing the same, but in Asian countries at a more accelerated pace. But I mean, come on, who can resist this adorable red and white kitty, especially in the home? 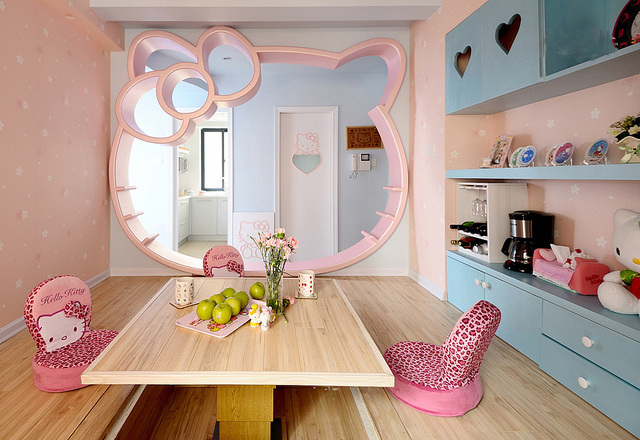 Ever wondered what your home would look like if you chose to go in the Hello Kitty direction? 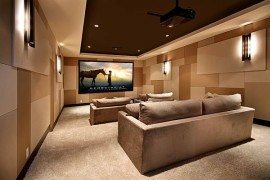 Maybe you were hesitant about featuring cartoon decor at home, or maybe you liked the concept but just wanted a few more ideas before tackling such a adventurous change. Regardless of your reasoning, here are some adorable and highly functional designs that are sure to knock your socks off! How about a giant cushioned wall in the shape of Hello Kitty’s face? When paired with the sweet, delicate pink-and-white-striped wallpaper, the decor above is an excellent example of how you can give the living room a subtle touch of texture without overwhelming the space. 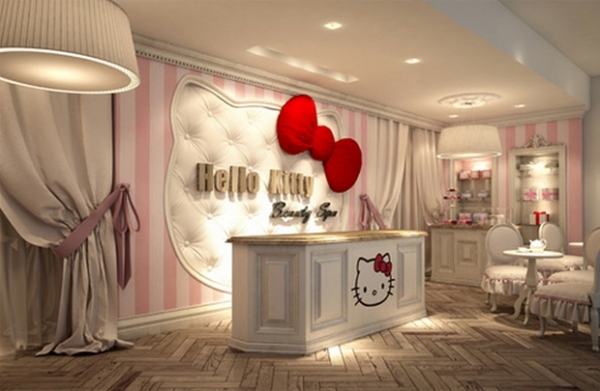 Leave all other children’s room designs by the door, because Hello Kitty is here to stay. 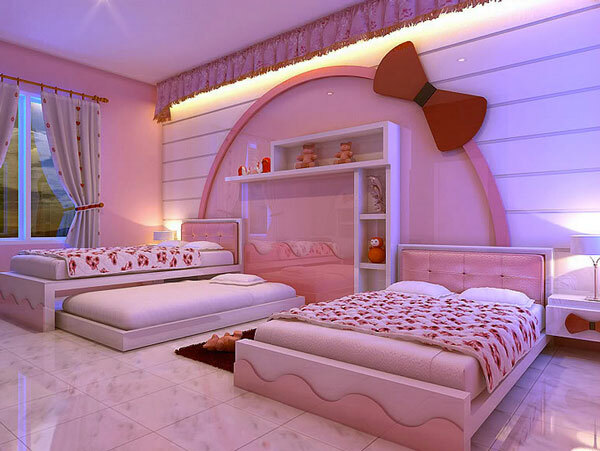 Below are some interesting and extremely innovative bedroom designs that will even tempt some adults’ curiosity. 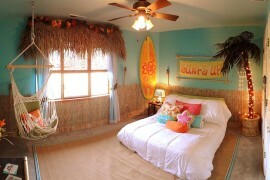 The room above is fairly easy to accomplish. Duvet covers and Hello Kitty decals are two simple additions to the room that will steer your decor in the right direction. 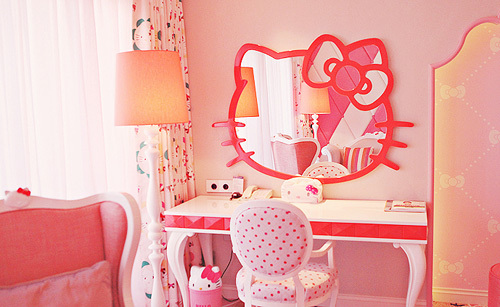 If you want to get fancy, perhaps the giant Hello Kitty mirror above is a DIY project you might want to tackle! Just remember to limit yourself from other Hello Kitty decorations around the home, mainly because with such a large element, you wouldn’t want to clutter the shelves. 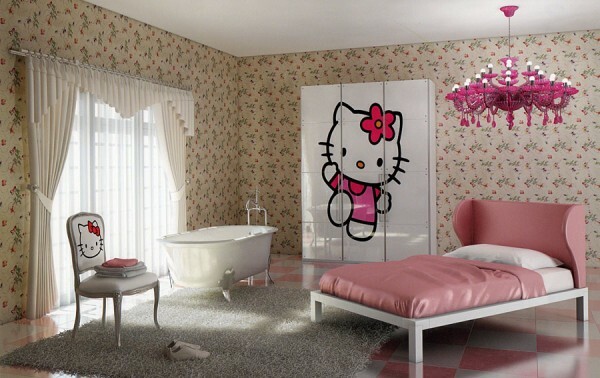 For those of you with a due date, don’t forget about Hello Kitty when renovating that extra bedroom for the baby! Not matter the age, so many females fawn over the enchanting charisma of Hello Kitty. 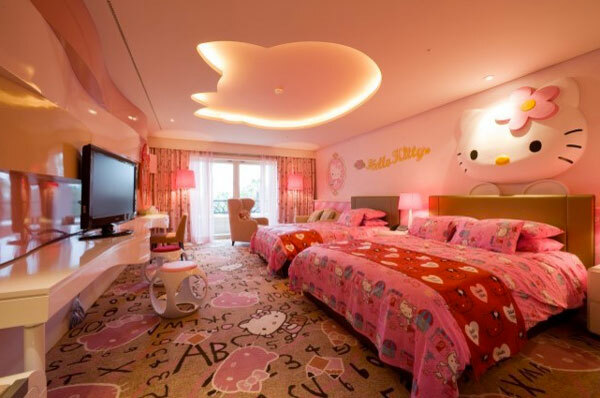 Keeping that in mind, there is no shame in creating a Hello Kitty bedroom for yourself, even if you’re past your youthful prime. 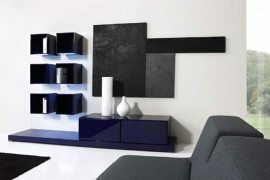 Incorporating a healthy dose of modern design will help put things in perspective. 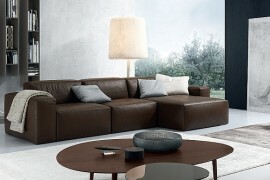 If you are tired of rectangular beds, then maybe a round one like the one above could cater to your tastes. 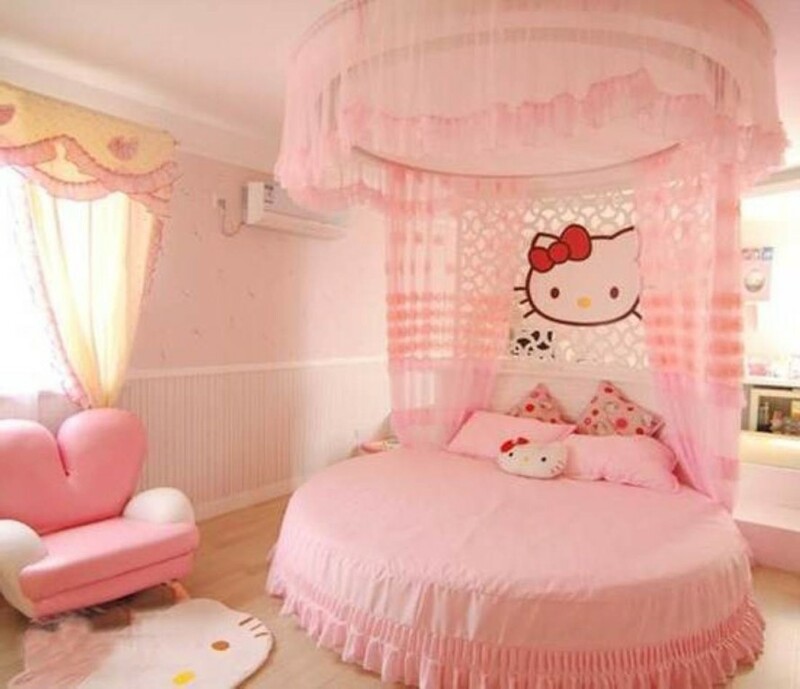 Match the pink duvet and pillows with a Hello Kitty rug and a heart-shaped armchair for an elegant bedroom design. Whoever said vanity desks can’t adopt a Hello Kitty theme is largely mistaken. It may be hard to come across a Hello Kitty desk, but you can think outside of the box and select a white and pink item like the one above. When going for a simple office design or a unique study room, design improvements do not need to be too extreme. 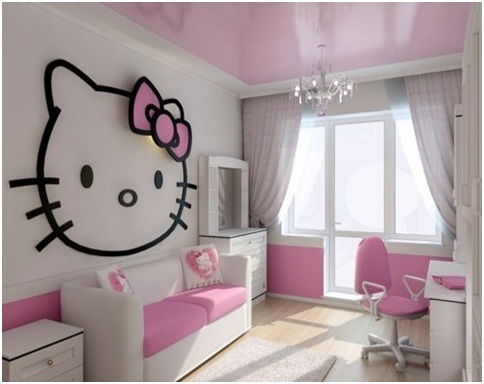 A simple Hello Kitty wall decal and a petite chandler are all you need. 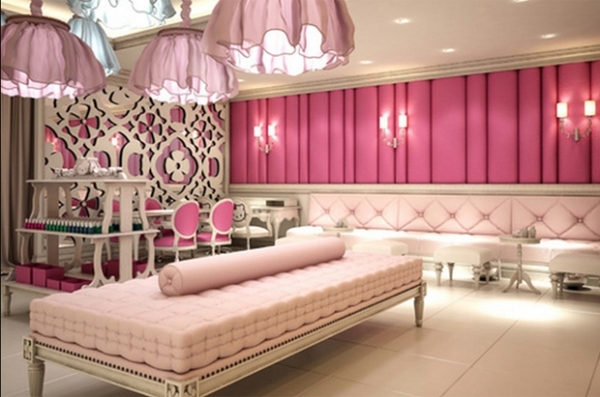 Again, you can see that chandeliers have a strong connection with the Hello Kitty theme. The room above does not feature too many embellishments, except for a Hello Kitty chair and a closet, but everything comes together perfectly. Take inspiration from this!